This verse is the namesake for their song "Four Seven" (a hidden track on the CD release of their first album), which paraphrases the verse. Jars of Clay was first formed at Greenville College, Illinois in the early 90s, by Dan Haseltine, Steve Mason and Charlie Lowell. They had been playing and writing without thinking about an actual career in music, but more for fun ("like a dormitory acoustic group"). Second guitarist Matt Bronlewee joined some time later, and drummer Scott Savage also accompanied them in some live shows at this time. In 1994, they submitted a demo to a talent competition run by the Gospel Music Association and were selected as finalists. They traveled to Nashville to perform and won the contest. Back in Greenville, they started selling a self-released demo called Frail. That song was originally written by Steve Mason as an audition track for a scholarship to Greenville (his submission was successful). Their performance in Nashville and their demo managed to catch the attention of record labels, so the band decided to drop school and move to Nashville. At this time, Bronlewee left the band to finish school and settle down with his fiancee. He was replaced with Matt Odmark (Lowell's childhood friend). Jars of Clay signed with Essential Records and started recording their first full-length album. Former prog-rocker from King Crimson and recent Christian convertee, Adrian Belew, heard the band and offered to produce the album. This debut album was released in 1995 and one of the songs, "Flood", became a hit in Christian radio stations. When the song began to climb the charts on mainstream radio stations, Silvertone (Essential's parent company) heavily promoted the song, turning it into one of the biggest mainstream hits ever had by a Christian band. The album has since passed the double platinum mark. The band toured in support of bands such as PFR and Michael W. Smith and even with a religious bands like matchbox twenty and Sting. This resulted in a small backlash from conservative Christian groups. They also released a Christmas EP titled Little Drummer Boy at the end of 1995. A re-release of the Christmas EP was released in 1997. 1997 also saw the release of their second album, Much Afraid, produced by Stephen Lipson. The album sold well and won them a Grammy. However, it didn't reach the same level of success as its predecessor. Fans suspect that this is because Christian groups who backed their first album were hesitant to back a less overtly religious (although still strongly Christian) release. In 1999, they released their third album, If I Left The Zoo, produced by Dennis Herring, and it reached gold status. It also earned them their second Grammy. By this time, touring drummer Savage left the band's live performance to play for Jaci Velasquez and was replaced by Joe Porter. In 2001 the four members of the band received Honorary Degrees at Greenville College, where three of them had studied before dropping out in 1994 to move to Nashville. In 2002, the band produced and released their fourth album called The Eleventh Hour which earned the band their third Grammy in a row. Unlike earlier albums, The Eleventh Hour was conceived as a Christian rock album, relying on studio musicians and the band's touring musicians to fill in for the band's lack of drums and bass. 2003 saw the band retreating back to their folksier sound. The double-disc Furthermore: From The Studio, From The Stage featured an acoustic EP and a live EP. The acoustic EP consisted of reworked The Eleventh Hour songs, rearranged fan favorites, two The Eleventh Hour b-sides, and a cover of Adam Again's "Dig" (intended as a tribute to the then-recently departed Gene Eugene). The live EP featured a sampling of hits from the bands career. The band continued the more acoustic and organic approach of Furthermore on their fifth studio album called Who We Are Instead. Released on November 4th, 2003, Who We Are Instead showcased them revisiting various styles they'd tried up to that point, as well as experimenting with new influences, such as gospel, hymn-song, and Nickel Creek's "newgrass" style. In 2005, the band released Redemption Songs, a collection of old hymns the band used to play in church. Although the band did not write any new songs for the project, they did rework most of the songs with new melodies. Particularly exciting was an acoustic rocker called God Will Lift Up Your Head, which was a hit for the band on Christian radio. Also in late 2005, the band announced that the writing for a new album was nearing completion, and that they would be returning to the studio to record the album in the spring. This new project, entitled Good Monsters, is set for release on September 9, 2006. Backstage at the 2006 GMA Awards, Jars of Clay mentioned that the new album will be their first ever rock record. Jars of Clay popularity has risen as their acclaimed song Flood became the theme song to A&E's documentary God or the Girl, tracking the lives of four young men deciding whether to become Catholic priests. Jars of Clay's catalogue is published by Brentwood-Benson Music Publishing, the CCM division of BMG Music Publishing. Lead singer Dan Haseltine visited Africa in 2002, which in turn inspired the founding of Bloodwater Mission, a non-profit organization created to raise awareness and money for the poverty and AIDS stricken regions of the continent. The name is derived from, as Haseltine says, "The two things Africa needs most" - clean blood and clean water. The mission has begun the 1000 Wells project, an effort to have a thousand new wells built throughout Africa. The band has always been open about their Christian beliefs. Though this hasn't spared them the backlash from some Christian groups, they have stood firm. They claim that "the music comes from a place of true reverence and appreciation of our past and an attempt to leap across the years and articulate that past in a language that could be embraced by us as 21st-century people of faith." Jars of Clay is a four-member Christian band formed at Greenville College in Greenville, IL. The band has been praised for the unique mix of pop, folk, rock, and mild electronica, as well as for the graceful way they communicate their beliefs through their music. The religious overtones, acoustic guitars, and programmed drum loops of their early work have led people to refer to them as a Christian Rock band, in spite of the band's lack of a permanent drummer and bassist. Jars of Clay is: Dan Haseltine, Charlie Lowell, Stephen Mason and Matthew Odmark. 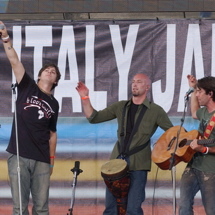 The band has no permanent drummer or bass player, though these roles were most recently filled by Joe Porter and Aaron Sands in their live concerts. Both have since stopped touring with the band.